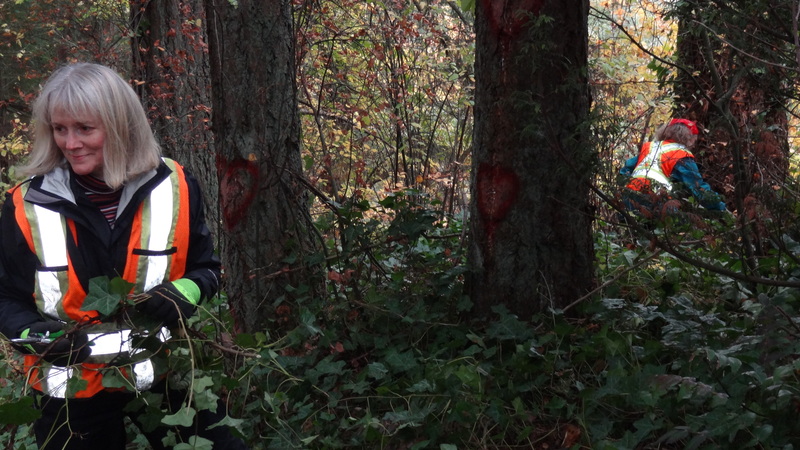 Thanks to all ivy pullers – you were great! 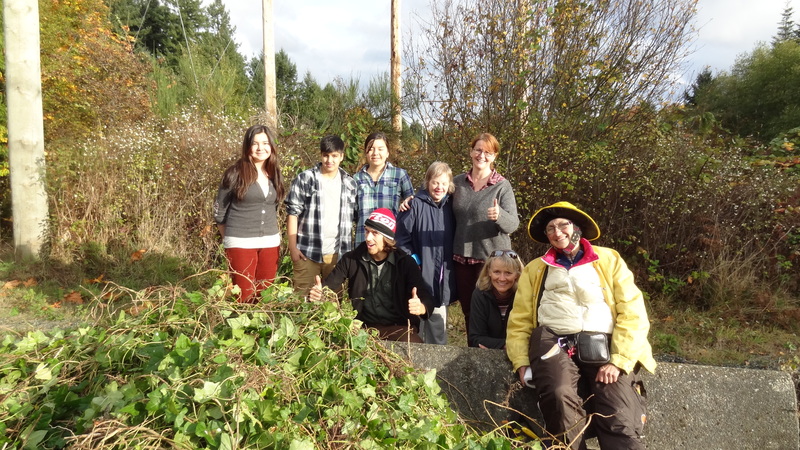 Last Sunday nine South End residents dug into the Chase River Estuary Park. Not digging for treasure or berries, rather to get rid of a load of ivy. 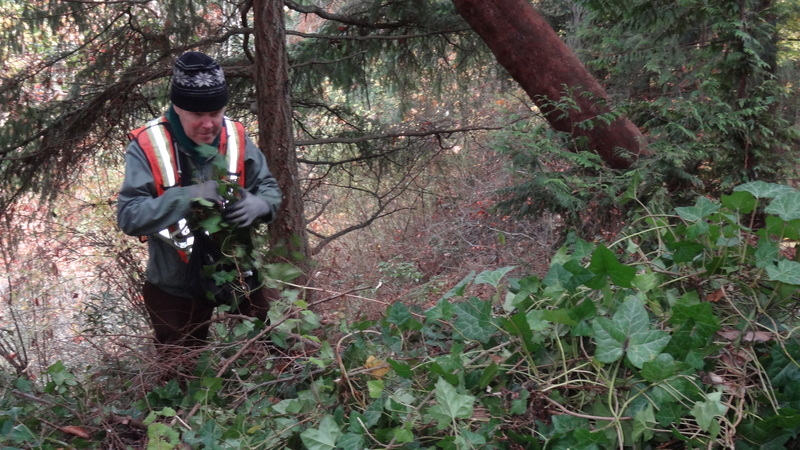 Picking a hard to reach patch where ivy was already invading the trees, the party dragged out 8 tarps full of ivy. This first try-out (meant to measure the difficulty level of this kind of activity) was all positive: (almost) no rain, no one cut his own fingers, lots of ivy got out and the celebration cake was easily digested by the entire party. Thank you (in alphabetical order) Anita, David, Joan, Keith, Lorraine, Michaela, Sidney, Signey and Rebecca! Thanks to Nanaimo Parks Department Deborah and Gail for their advice and gear. Update! We’ll meet this Sunday afternoon at 1pm at the parking lot Chase River Estuary, behin the Bold Knight. We’ll keep going roughly untill 4pm. All extra helping hands are welcome, for any amount of time you can spare. Please give Thomas a call on 250 797 0682 to confirm, or email at thomas_mol [AT] Yahoo.com. Please bring garden gloves and dress for the rain. 5. Possible presentation: Could we have Steve Arnett & Mike Hunter come to give a presentation to a larger meeting? 7.Dog use in Deverill Square. Possible off leash area behind basketball court. Is it possible to get doggie doo stations at Chase River Park? 9. Meeting: Could NA’s arrange a meeting with Bernie Dumas? 11.Needham/Haliburton redevelopment: Patricia and Jolly Miner activity has calmed down in the past month; Floyd’s plan would like to do definite changes on property. Eventually, would like to build apt or office building. They have to know what the rest of the neighbourhood is going to do. Floyd wants to look at housing for all price points (higher and lower). Has been working on Dalton (Dominion) Hotel in Victoria (upgraded all power transformers; 3 ½ year process). Built Liquor Express in Tillicum Mall. If SECA could lobby Nanaimo City Hall to make building development process go quicker that would be great for the developer. 12.Patricica. Bar Watch (If you’re barred in one bar, you’re barred in all Bar Watch bars) program has been started. There are ebbs and flows. Almost five years after the province seized the Nanaimo Hells Angels’ clubhouse, no date for a civil trial has been set to determine the fate of the property. Members of the South End Community Association have started a petition to push Nanaimo council to take action on a “dangerous” intersection they say needs traffic lights before another accident occurs. You can download a copy of the petition letter by clicking here. If you support this project, would you consider printing off a paper copy and signing it ? You can drop your copy off at Sandra’s (721 Haliburton), Sydney’s (163 Irwin) or Pat’s 934 Highview Terrace. The students are 15- 17years old from Japan. They are looking to experience life with a Canadian Family.